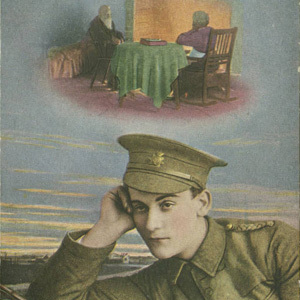 Postcards were a popular and inexpensive means of keeping in touch during the Great War. In addition, they boosted morale, encouraged patriotism, and served as an important propaganda tool. Designs included national themes, political cartoons, patriotic imagery, and humorous and sentimental messages. Photographic postcards depicted every aspect of the war from soldiers training to battlefield scenes, the machinery of war, and its devastation, and scenes from the home front. Postcards often featured patriotic imagery, humorous themes, and sentimental messages. The work of many well known artists and illustrators of the period appeared on postcards. The Joseph M. Bruccoli Great War Collection includes over 200 separate postcards. Most were printed in the United States, Great Britain, France, and Germany. Postcards will be added as they are acquired and in a later phase of the project, postcard books and postcards in albums will be added to the digital collection.